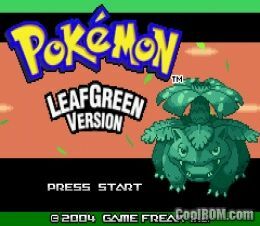 I recently got a copy of Pokemon LeafGreen at a convention since that’s one of the only Pokemon games I don’t own. I have loved Pokemon ever since I was a kid and first started watching the Anime, then buying up the cards, then begging my mom to by me Red when it first came out. Still, my love for the games has been somewhat limited. There are big gaps in my memory for a lot of the Pokemon past the first generation. I also seem to remember that I haven’t fully played a couple of Pokemon games. There’s also a lot about Pokemon I don’t fully understand (like “natures” and “IVs” and “EVs”). At best, I’m a casual player. Still, I have been inspired. I like watching PokeTubers like TheKingNappy and ShadyPenguin when they do Nuzlockes. Therefore, I have decided to do a Nuzlocke. I’m no stranger to the rules, as I’ve attempted a Nuzlocke of Soul Silver before. Depending on how this goes, I’ll be Nuzlocking every Pokemon game I own, starting with Leaf Green. I’ll go in order of the “generations;” however, I’ll be doing “LeafGreen” instead of “Red,” and “Omega Ruby” instead of Ruby, just because those are easier. I’ll also be keeping a log of my Pokemon travels. I’m calling it Daffy’s Nuzlocke Journal. I’ll be writing it from the perspective of the character I made in the game, Daffy. Think of it as if the character is keeping his own personal log of his journey. If you’ve never heard of a “Pokemon Nuzlocke,” here are the rules. If a Pokemon faints (aka loses all its HP), it is considered dead. Normally, people release them. Instead, I’ll be keeping a box of dead Pokemon in my PC. If all my Pokemon “die” in a battle, I lose. I’m only allowed to catch the first Pokemon I encounter in each new area. If I accidentally kill the Pokemon, or if it runs away or roars me away, I can’t catch any Pokemon in that area. I have to nickname the Pokemon so I’m more emotionally attached to it. If I find a Pokemon in an area that I’ve already caught (or I caught one of it’s evolutions already), I can get the next new Pokemon I see. I’ll explain how these rules work in the “world” of the game as I go through the journal itself. Today’s the day! I’m finally going out on my own Pokemon Journey! I was so excited that I kept waking up last night. I’m not tired, though! I ran out the door and looked everywhere for Professor Oak. I ran into his jerk grandson, NAPPY. NAPPY is so rude and full of himself. He thinks he’s sooo cool just because his granddad is the Pokemon Professor. After eventually finding him, he finally let me pick one of his super-rare Pokemon! They were all really cool looking, but when I picked up the Bulbasaur, it gave me the cutest looking face. I had to make him mine. So I named him Lewis. He just looked like a Lewis. He’s a little bit Naive, this cute little guy. He keeps poking his head at flowers and grass, trying to make friends. I must have taken at least a dozen pics of him by now. Anyway, I had to use Bulbasaur a few times to help me fend off some small bird and rat Pokemon, but they were no match for him! The poor thing is too curious for it’s own good, though. We came across another rat and I was trying to train Lewis to make him stronger. But Lewis just got close to it and tried to sniff it. The stupid rat attacked Lewis so hard that he almost died! I had to rush him to a Pokemon Center right after. Dumb rat nearly killed my first Pokemon. I went into the PokeMart to get a few things to prepare, but the clerk immediately gave me an errand to run. I had to take a package back to Prof. Oak. Long story short, he gave me a new gadgety thing! He called it a PokeDex. I guess it’s supposed to index new Pokemon I capture and encounter. Then, he gave me exactly what I needed: Pokeballs! Now my journey can finally begin for real! I’m not made of money, though. I can’t afford to feed too many Pokemon or buy too many balls. I’m going to limit myself to just one Pokemon in every new place I go. On Route 1, between Pallet Town and Viridian City, I found another one of those bird things! Good thing I read that manual on how to be a Pokemon master, or I wouldn’t have known how to use a PokeBall! So, I caught myself a Pidgey! Her name is Gidget. She’s a Hardy little thing. Put up quite a fight trying to catch her and she is always puffing her chest as if she’s ready for anything. I really like her. After wandering around a bit, I ran into this old guy who wouldn’t shut up. Even tried to teach me how to catch Pokemon even after telling him a bunch of times that I already knew how to do it. Old geezer doesn’t know how to listen. Anyway, on this route to the west of Viridian, Route 22, I found this little rat… Apparently they’re called Rattata. Neat. I’m calling him Ratigan ’cause he tries to bite me whenever I pick him up. He also has a tendency of flipping his tail in my face. He’s a Naughty boy. I felt a little worried about going down the rest of Route 22 (something told me I was going to have a bad time if I kept going), so I decided to go back to Viridian to buy some medicines and some more PokeBalls using the money Mom gave me to start off. From there, I went North to Route 2. I kept finding more Rattatas and Pidgeys and they all looked pretty dirty, so I just kept looking. I finally found this cute looking bug that’s apparently a Caterpie. I named it Heimlich. As I was getting to know Heimlich, I tried to teach it how to fetch and play games. It’s pretty stubborn, though. Guess he’s just Adamant about not learning new tricks. I’ll teach him how to fight, though. Anyway, it’s been a pretty long first day. Think I’ll set up camp and rest for a bit before moving on. I’m pretty sure there’s a forest nearby. I can’t wait to see what’s up ahead! This entry was posted in Nuzlocke, Pokemon, Video Games and tagged Gen 1, Nuzlock, Nuzlocke, Pokemon, Pokemon Leaf Green by richard0211. Bookmark the permalink.